Here are seven delicious banana recipes to enjoy before Bananageddon. Bananas as we know them are in danger. The culprit is a fungus, commonly known as Panama disease, which infects the roots of banana plants and causes them to rot. The disease was first reported in Taiwan and Indonesia, but has now spread to Australia and most recently, Africa. While it remains to be seen if the fungus has arrived in Latin America (where most of the bananas found in the U.S. are grown), it can't hurt to play it safe. Here are seven delicious banana recipes to enjoy before Bananageddon. Bananas star in this healthy, super-fast breakfast shake. This delicious breakfast casserole is a great way to use overripe bananas. Nancy Silverton's delicious, tender bananas are coated with brown sugar caramel. These over-the-top treats are completely gluten-free. What's the secret to this incredible dessert? 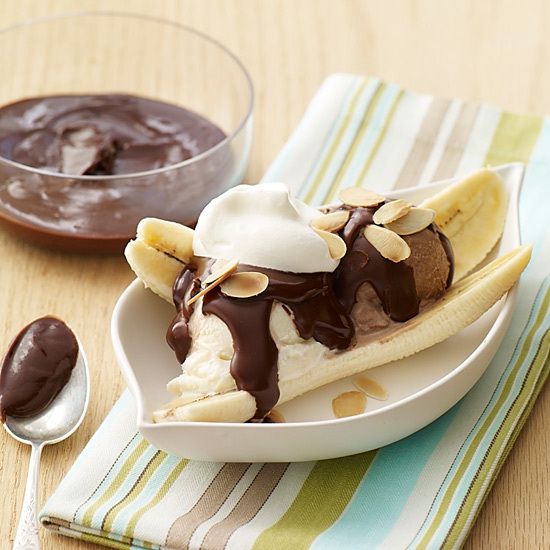 Fudgy chocolate sauce and a light, crunchy almond topping. This healthy version of the classic bread is sweetened with agave nectar. "It's the most famous, most amazing, best tasting banana pudding recipe in the world," says Andrew Zimmern.